To me, I think the most frightening thing about the Sept. 24th meeting, was the panel deliberations. 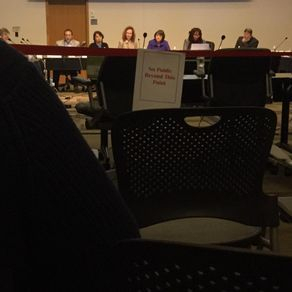 You see, this panel was appointed to make suggestions and recommendations to the FDA on what to do about Essure. No one on the panel, or at the FDA, or Bayer could answer some of the very serious questions raised about Essure. The women in the audience could've answered every single question. You see the ones living with the device have done the research, have lived through this nightmare, we know the answers to all of those questions. We even knew the answers to the questions about the clinical trial participants the clinical trial information, the nickel testing, the removal of the nickel contraindication, we know all of that, we could've stood there and gave them that information. Yet we were not allowed to speak. We were behind the red tape. It's frightening that the panel members can suggest 99 ways to try to keep essure on the market. And we know why those 99 ways will fail. Yet we could not stand there and tell them why each suggestion was going to be a failure. Why the registry isn't going to work. A three or even five year registry isn't going to show the autoimmune disease that shows up seven or ten years after implantation. Why handing a patient identification card isn't going to work because that's already supposed to be happening, yet it's not. They didn't even know that. It was insulting that we had to sit there silence on the other side of the red tape. Suggesting a patient identification card was such a joke, because that's already a practice that is supposed to be in place, yet half of the doctors don't handout identification cards. Those of us who have cards find them useless because most people don't even know what essure is when we hand them the card. Nor do they know what the card is even for! 99 ways to try to make essure seem more safe and effective is only going to prolong another decade of suffering. Three minutes is not enough time to express 13 years of information, experience and research that we have. One of the panel members asked about studying extracted tissues. We already collected that information and would love to hand it on over to him. We have done more work to prove that essure is not safe or effective and no one is willing to look at our information. It was like banging our heads against a brick wall yesterday watching those deliberations, I couldn't even express my frustration as I walked out of there. We have the answers for you panel members, we have the answers for you FDA, all you have to do is ask us and we will show you. I am not a doctor, I am a metalsmith. But that does not make my knowledge of essure less real, it doesn't make our knowledge or our information un true. We can present to you allergy reports, operative notes, toxicology reports, bloodwork, x-rays, CT scans, MRIs, radiology reports, we have the medical information right in our hands. We ask you to take a look at it, don't spend one more minute trying to keep this device on the market spend, your time wisely. Protect your people. This is only birth control. How dare the FDA leave an unsafe medical device on the market when the information is right here in our hands? Requesting more imaging was such a painful request for me to hear. One of the main problems with this device is imaging. Imaging does not show perforation, imaging does not show fragmented devices. The outer coil does not even show up on most imaging. Hundreds of women have been told that their devices look to be in place there look to be no problems, “we see no issues” they say. But once in surgery, often years later, the doctor finds the perforation or the migration or the separation of the outer coil from the inner coil, and so many of the other problems that come with this device. Problems that do not show on imaging. No one on the panel even mentioned how some of the suggestions are going to be covered by insurance, for example more imaging! It's hard enough to get insurance to approve a CT scan or an MRI or an x-ray as it is. Most of the time women can't even get the three-month follow-up checkup. Implementing another x-ray? Insurance is not going to play that game. You don't understand the hoops that we have to jump through just to get help. For example the panel mentioned that if a woman is having continuing pain or continued bleeding, well then maybe that's a sign that it's time for the device to be removed. No insurance company has a code for essure removal. No insurance company just approves removal on the basis of pain or bleeding. It's not going to happen. Insurance is going to require you to have an ablation or to take birth control pills. If you're having an allergy and you're covered in hives, insurance isn't going to approve the removal of your medical device. They are going to tell you to get steroid shots, they're going to tell to take Benadryl. No insurance company is going to pay for the removal of essure if you're having pain, they're going to tell you to take pain pills they going to tell you to take anti-depression medication. I just wanted to stand up and scream all of these things. There really should be an industry representative from an insurance company sitting on these panels, so they can say uhmmm no, insurance is not going to cover that. The panel can suggest what they want to the FDA, and the FDA can recommend what they want to Bayer, but when it comes down to it, is your insurance going to approve it? And the answer 90% of the time is no. I have found a medication that stops my headaches. I have had a headache for five years. My doctor gave me a sample of it and it worked! For FOUR days out of five years I did not have a headache!!! It was HEAVEN! But my insurance will not cover that medication. What they will pay for are the MRIs and CT scans, pain medication, pain injections and steroids, none of which actually make the headaches go away. But they won't pay for that one pill that makes me function as a human being. It doesn't make any sense, none of this makes any sense. I walked out of there yesterday with my mind in a blender. Fearing for the future of my children that these are the people in charge of our food, our drugs, and our medical devices. What have we done? We must make this right. WE, the people on the other side of the red tape. We must make a change. The docket is still open to file comments on the medical device Essure and I implore all of you to continue to submit to the FDA your evidence that essure has failed. Not only your story, I want you to upload your pathology reports, your x-rays, your prescriptions, anything and everything medical that you have related to Essure. Show the FDA. We need another letter writing campaign to our congressmen. Amanda Rusmissel has stepped up and offered to organize that and I'm going to work with her and find the most effective way that we can start another letter writing campaign. Hooman has offered us a form letter to copy and email and I have that up on our website. For the love of your children, and the future of your children and the world that they live in, we need to fix the way our system works. The FDA is a mess. The pharmaceutical companies are a joke, money is the root of all evil, and we have to take this world back. We live in a democratic society where the people have the power to make a change. But you have to do the work you can't just sit back and just complain about it and watch it happen and let it happen. Help me make the changes that we need not only for just this one device, but for the entire regulation system at the FDA. We'll take it one step at a time. We've made it this far and we rocked that FDA room yesterday! Bayer walked out of there with their tails between their legs in their heads down. They know that we have the truth. 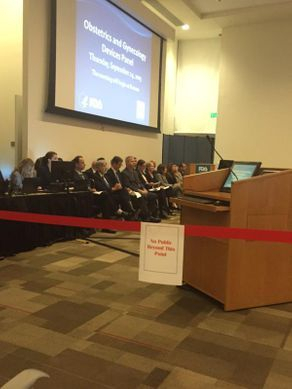 I found it offensive that the FDA members sat alongside of Bayer yesterday. That was a big red flag to me that they were sitting on that side. To watch them all laugh and shake hands and mingle after the deliberations were over, was sickening. None of them made an effort to come talk to us on the other side of the red tape. Last night after the meeting Lauren Gilger's camera man pulled me aside to ask me a few questions and my head was just in a blunder. I couldn't get my words together. I couldn't get my thoughts together it was a long day. And I felt worried that I wasn't going to be able to get across all of these thoughts that I'm getting out now. It takes me time to process and think and to write it all out. So I need to do this, I need to get this out, these are my feelings, these are my reactions, I'm not good on the spot, I need time to process and to think and to wrap my head around everything that was said and to review the minutes. We were there for 12 hours, and a lot of information was covered, there were a lot of speakers, and it's going to take some time to go through it all. To really get a firm grasp on what was said. In my heart I felt like it was a victory, that they saw us and they heard us. But in my head I know the reality of this game. And it's not over till it's over. I’m so disappointed in the tech crew at the FDA and what a failure they were at playing our PowerPoint presentations. Cutting people off before their time. In the words of Kim Myers, Bayer has had years to prove that Essure is safe and effective. The FDA gave us three minutes.